Both tried out for the role of B.A. Baracus, formerly played by Mr. T, and Rampage was selected. Game didn’t take to this kindly, and had a few words of constructive criticism for the wrestler. This could get interesting, or it could die down within the next couple of days as 99% of these disputes usually do. 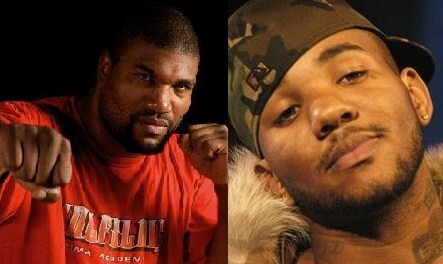 Either way A-Team has grossed over $76 million to date, so I doubt the producers have any regrets about their decision. UFC star Quinton “Rampage” Jackson hasn’t been successful in the fighting business lately, but luckily he has another gig that’s working out for him nicely. The fighter co-stars in the movie “The A-Team” which has been well-received by the public, drawing a rating of 7.4 based on upwards of 20,000 votes on IMDB.com. “The A-Team” hit theaters on June 11, in the States at least. 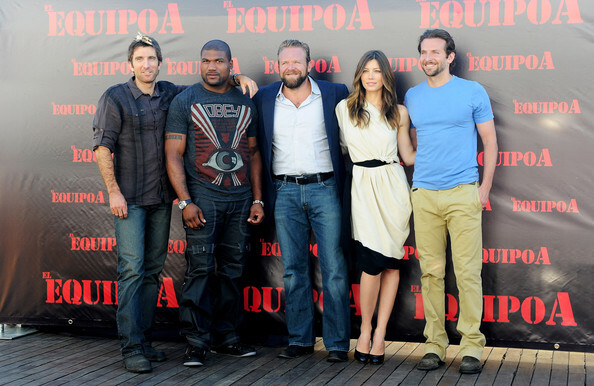 As to explain why they were in Madrid promoting the movie, I’m guessing it had a later release date in Spain. Rampage (far right) looks a little out of it in this scene, but I’m sure he did a somewhat decent job in the movie. His mohawk does contrast nicely with the explosion in the background, so he’s got that going for him. Couture is also a former marine, serving from 1982-1988, so he jumped at the opportunity to show Marines stationed at the Camp Pendleton Marine Base in San Diego a pre-screening of his upcoming film. Other co-stars such as Sylvester Stallone and Bruce Willis were present as well, and signed autographs for the crowd. Here is the trailer for the movie, which looks like it could be the next big-time action flick. Judging from the cast, I don’t know how this film could go wrong. UFC president Dana White has an eye for talent when it comes to fighting, but apparently that good fortune doesn’t translate to the NBA. 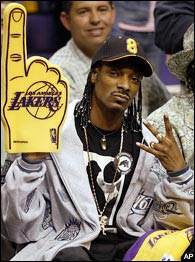 White made a wager with Snoop Dogg on the NBA Finals, picking the Celtics to win the series against the rapper’s Lakers, with the winner taking home $20K out of the opponents pocket. In all fairness to the nature of the bet, the winner was to donate the money to charity. The ‘Snoop Youth Football League’ was the lucky destination of Snoop’s winnings. Actor/musician Donnie Wahlberg also made a $20K bet with Snoop against the Lakers, so all in all the hip hop hustler walked away with $40K for his charity.